Vellore: In a story that would strike a bell with most medical practitioners in the country, Criticism, despite non-stop service, has driven a government doctor to tender his resignation from service. A recent report in TOI narrates the story of Dr Sathiaraj Nesan, 44, who had been, associated with Government Hospital (GH) in Vaniyambadi since 2007. For his distinguished service, the doctor has been honored as the best government doctor in Vellore five times, and he also holds into his credit, the successful establishment of an exclusive unit for the Ophthalmology department, where he has performed over 7,000 successful cataract (SICS and PHACO) surgeries, glaucoma surgeries, autograft and oculoplastic surgeries, since 2010. Even in the month of August 2017, he reportedly performed 99 surgeries out of the 167 that were done at the Institute. 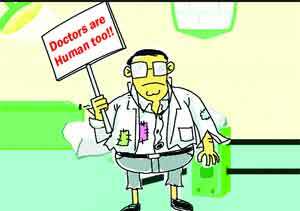 The distinguished doctor recently became the subject of utter humiliation at the hands of 10-15 attendants of a patient. TOI reports that the incident goes back to August 29, when a 20-year-old boy came to the doctor with complaints of fever and cold. Since the doctor was attending to another patient at that time, he requested the patient to go to the nurse. When questioned by the boy’s father, the doctor explained that he had seasonal flu. This answer angered the father, and a result, a mob of 10-15 people soon barged into the doctor’s room and began humiliating him. Dr Nesan’s resignation has indeed struck a chord with many medical practitioners, who are not only humiliated on a regular basis at the hands of disgruntled patients but are even subjected to physical violence, depending on the whims of the mob that often accompanies a patient in government hospitals. Medical Dialogues team had recently reported that 35 doctors associated with a Madhya Pradesh hospital had submitted their mass resignation after their colleagues were brutally assaulted by a mob. Dr Nesan, we understand your agony. Unfortunately we live in a society and country where the wheels of the legal system moves very, very painfully slowly. Therefore there is nothing that we can accept from the government. No punishment is meted out to wrong doers. It is a jungle out there. We, sincere folks, simply work with dedication because we are made that way and we cannot fight the mighty lawless citizens. Sir, it is a lesson for us to not try to improve our society. Just do our little bit and not face such goons in future. This is a lesson we all learn with a heavy heart. Till the legal system, political class and the society as such learn to respect the law India will not change. You and I are too small to introduce some change. why a case of common cold goes to an ophthalmologist and then starts such things suggest it is not a normal case. The incident points to a collapse of society.